Victor Bolivar, sales specialist at Westover Jaguar in Poole, has been presented with Jaguar’s top national sales award. 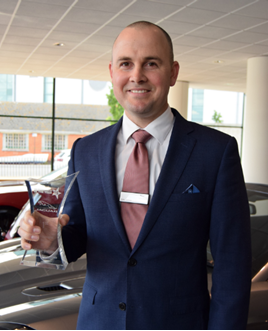 Having been placed first in the South West region – one of six of Jaguar’s sales regions across the UK – he went on to take the national crown at an awards ceremony held at the Four Seasons Hotel in Hampshire. Bolivar (pictured) has worked with the Westover Group for nine years, three of those at Westover Jaguar’s showroom on West Quay Road in Poole and the previous six years at Westover Fiat. Andy Grant, Westover Jaguar Land Rover brand manager, said: “Huge congratulations go out to Victor on his fantastic achievement - everyone here at Westover Jaguar is so pleased for him. Jaguar has a wide network in the UK, so to be named national Sales Specialist of the Year from a huge field of peers is a real feat. Victor was named Jaguar’s top performing sales specialist based on the number of sales he made throughout 2015. Congratulations Victor a well deserved award!